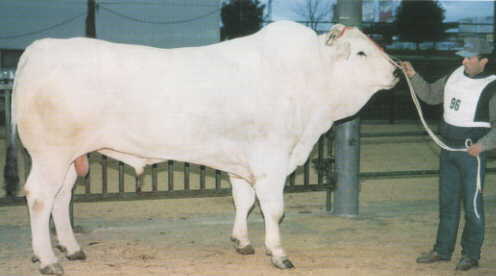 The porcelain-white Chianina is the largest breed of cattle in the world. Large cattle were known in Lucania during Roman times and the Chianina may well trace back to these. The average Chianina cow stands 150-160 cm at the withers and weighs 800-1,000 kg, while the bull measures 160-175 cm, weighing 1,150-1,280 kg. Cows over 160 cm and bulls over 180 cm are not uncommon. The world record for cattle weight was set in 1955 by the Chianina bull, Donetto, which weighed 1,740 kg. Chianina oxen are known to reach wither heights of 190 cm. Besides their large stature and long legs, the Chianina is characterized by short horns; in Canada a polled heifer calf was born in 1986. The head is small and fine and the bulls show a pronounced crest. The fore and hindquarters are heavy, while the body is long. Calves, which weigh 45-50 kg at birth, are initially fawn to reddish in colour and turn to white in about five months. Once the breed was respected for its excellent draught qualities. Bullocks as well as cows were harnessed - because of their temperament both sexes are still nose-ringed. Today the Chianina is selected exclusively for beef and efforts are being made to develop a deeper body. Traditionally the cattle are kept indoors all the year round. Growth rates are high and consistent: young bulls are fattened and will reach a weight of 600 kg at 15 months, dressing out at 62%.